Our system produces fast, safe, effective whitening in as little as 60 minutes. You can get the smile you’ve always wanted in as little as 60 minutes depending on your shade of teeth and the level of brightness you want to achieve. The whitening (bleaching) gel is applied to the teeth and the LED accelerator light is positioned directly in front of the teeth. After 15-20 minutes, the patient rinses his mouth and the entire procedure is repeated up to two more times for a total of up to three applications or treatments. The final shade of the teeth is matched on the shade guide and the patient is provided with after-care instructions. 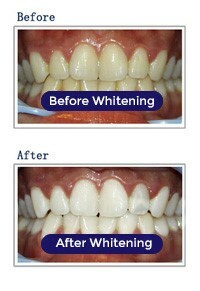 Beaming White recommends that a home whitening kit or pen be used to further the whitening results at home. We also recommend that a re-mineralizing gel be applied to the teeth. The whitening results from laser teeth whitening can last anywhere from 6 months to 2 years, depending on many factors such as dietary habits and oral hygiene. It is recommended that the procedure be repeated at regular intervals with a minimum frequency of 6 months. There are a variety of factors that can affect the lifespan of your newly whitened smile. For instance, if the reason your teeth were discolored is because you routinely drank coffee, tea, or wine and you don’t change that behavior, you can count on some discoloration returning very quickly. The same goes for smoking and eating dark colored foods. The more stain-causing substances you consume, the shorter the amount of time you can expect your results to last. Poor oral hygiene after a teeth whitening treatment can also prematurely darken your teeth. Adequate brushing and flossing is essential in removing plaque and stain-causing substances (like coffee and tobacco) and plays an important role in maintaining a healthy smile. Neglecting to take proper care of your teeth can not only have a tremendous negative effect on your laser teeth whitening results but can be harmful to your overall dental health. Another factor that can affect the lifespan of a laser teeth whitening treatment, is tooth dehydration. Some of the whitening you see with this method is produced by dehydration of the teeth caused by the light-assisted bleaching. When the teeth rehydrate (over 2-3 days after treatment), some discoloration can return. This is because the teeth are more permeable after the treatment and are absorbing fluids from the mouth. Directly after treatment, avoid smoking, eating, or drinking anything but water for 1 hour. For the first 24 hours (48 is better), you should abstain from the usual tooth-staining suspects: coffee, red wine, tea, soda, tobacco, and even citrus juices. For 3-7 days after a laser teeth whitening treatment, apply whitening gel to your teeth every day to prevent color regression and further enhance the whitening results. We recommend using the Teeth Whitening Pen or the Deluxe Home Whitening Kit. Brush and floss your teeth with a soft toothbrush at least twice a day, every day – especially after meals. If possible, brush immediately after eating or drinking anything other than water. Don’t forget to brush your tongue. Stain-causing elements can cling to the tongue and continue to stain your teeth even after you brush. 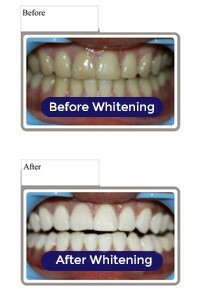 Touch-up your whitening once a month with a home teeth whitening kit, teeth whitening pen or our 1 Year Maintenance Kit. Use Daily White instead of toothpaste to actively maintain your newly whitened smile. Apply Minerals after every teeth whitening treatment or whitening touch-up to seal in the whitening results and re-mineralize your enamel. 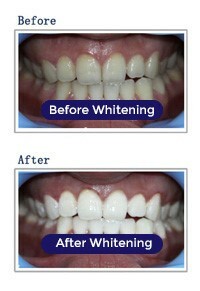 Let us help you achieve a sparkling white smile! 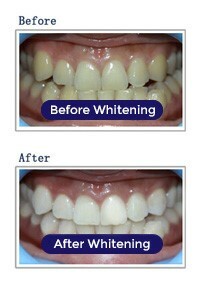 Call the office today at (361) 857-6200 to schedule your teeth whitening session.